Apparently there was a heinous case in Florida earlier this year in which a ten-year-old girl named Nubia was murdered, allegedly at the hands of her adoptive parents. This is, of course, tragic beyond words. It's all the more so because it was preventable. The girl's adoptive parents "had been investigated multiple times by the DCF [Department of Children and Families] for serious allegations of abuse and neglect. These investigations occurred while they were foster parents, during the adoption of the children, and afterward. In fact, they pulled the children out of the public school in the middle of yet another DCF investigation," notes a report by the Homeschool Legal Defense Association. That's right: little Nubia was being (cough) "homeschooled" at the time of her murder. So guess what was the conclusion reached by the grand jury investigating this case? That's right -- ALL homeschooling parents are therefore suspect. Surprise! Almost without exception, every homeschooling parent at one time or another has been on the receiving end of anything from mild surprise to outright hostility for choosing to educate our children at home. After all, why else would we make such a decision unless we wanted to hide the bruises? But Nubia wasn't murdered because she was homeschooled. She was murdered because bureaucrats didn't do their job. Even the grand jury makes it clear that if governmental officials had properly followed existing procedures, Nubia would not be dead. So what do they suggest? How's this for insanity: "The grand jury recommends that the law be amended to require every notice of intent for a home education program to 'be forwarded to DCF to determine if any reports have been made to the DCF Hotline,'" notes the HSLDA. "The grand jury went on to recommend that if parents had ever been the subject of a Department of Children and Families (DCF) investigation, they were to be immediately subject to a new investigation by DCF and required to submit to a period of monitoring, even if the previous investigation completely cleared them." In 2009, over 80% of Florida child abuse reports that were actually investigated were determined to be unsubstantiated, meaning there was "not sufficient evidence under State law to conclude or suspect that the child was maltreated or at-risk of being maltreated." Remember, all it takes is one disgruntled coworker or snarky relative making an anonymous call to have you investigated for child abuse. It doesn't mean you're guilty. 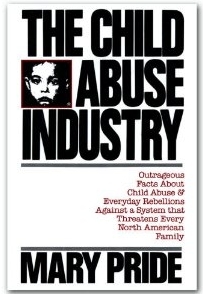 Anyone who's ever read Mary Pride's downright scary book The Child Abuse Industry knows that anonymous and unsubstantiated "tips" by unfriendly neighbors or weird relatives to the Child Protective Services hotline can start a nightmare of an investigation in which the parents are presumed guilty on all counts and an impartial investigation is virtually impossible. Frequently families are ripped apart for no reason. So now all homeschooling parents in Florida are automatically suspected of keeping their kids home in order to hide the bruises. "The recommendations are stunning because they assume that the lawful decision of parents to teach their children at home must be examined by DCF every single time," reports the HSLDA. "Even more concerning is the grand jury’s declaration that if parents had been falsely reported up to seven years ago and completely exonerated, they would be subject to an investigation and undetermined period of monitoring by DCF." See? Innocence isn't good enough. All homeschoolers are guilty. "While the purpose of such an investigation is 'to make sure motives are pure and covert child abuse is not the true goal,'" says the HSLDA report, "these recommendations go well beyond the realm of reason and what is warranted by this terrible situation. They would result in parents who choose a valid and legal educational option in Florida being treated as suspected criminals. Additionally, these recommendations would not have prevented the events in this case... While many serious concerns about Nubia’s adoptive family were reported time and time again, state officials failed to properly follow up on them." A bunch of bureaucrats fell down on the job, little Nubia died, and they're fixing the blame on the wrong parties. Hellooooo?? Grrrr. Stuff like this makes me see red. We never home schooled but we did have a nasty run in with the "Child Welfare" folk. It got so nasty I bugged my own home and phone and recorded our interactions with them to have proof of what they were saying and doing. Fortunately they backed down and revealed that a relative was behind the (false) accusations. Our case wound up OK after a very scary start, and showed us that someone we trusted was not trustworthy. It could have been much worse. I pray for families who have been falsely accused. Lord protect us from the do-gooders. Something like this happened near my home last year. A little girl was being abused and ended up either dying or being murdered, then her parents attempted to hide the body. Much was made over the fact that they had pulled her out of public school and claimed to be homeschooling her in the months before her death. This ignored the fact that they had moved several times to avoid or hide from investigations and that abuse had been reported and ignored while she was still enrolled in public school. Same deal though, rather than admitting the government agency dropped the ball, there were people writing editorials and posting on local message boards saying that homeschooling should be banned or parents investigated to be sure they were not hiding anything. Odd, because there have been several physical and sexual abuse scandals in the past few years involving children in local public schools and in day cares, but nobody calls for banning or monitoring of those environments like they do the home. Maybe because it would inconvenience too many people if they held strangers raising other people's children up to the same standards as they do the children's own parents. There are increasing reports of teacher/student relationships and yet no one has suggested that all teachers are suspect for joining the profession. BTW, I find it slightly amusing that any portion of our government would be charged with "making sure motives are pure". I'm not sure they would know what they were looking for. Since I live in Florida, I will make sure my state rep, senator and the Governor's office are aware of my feelings on this. It may be a bit of a preemptive strike, since the legislature isn't in session. They do continue to work on legislation to introduce next year. And this isn't a big surprise from the lawyers in Miami-Dade county. It has often been said the DA could get a Grand Jury to indict a ham sandwich. This kind of blame-shifting is going on in other areas as well, and it is horrifying. We are seeing our freedom tugged away before our very eyes. I shudder for our future. My adult children can't even comprehend how much has changed since my own youth, (in the last 50 years). It's like being on a different planet. Of COURSE, Patrice! Progressive liberals never admit they were wrong or that they ever screwed up and dropped the ball. As soon as a situation arises where they were negligent, they quickly blame any and all who disagree with then and the way they do things. In other words, they blame conservatives. Look at how many times our president has blamed his predecessor. His supporters, his staff and the liberal media do that constantly, as well. With liberal progressives, IT'S ALWAYS SOMEONE ELSE'S FAULT. And of course we conservatives are liberal's biggest threat, so conservatives will get the blame every time. When the liberal police chief in Tucson Arizona dropped the ball and didn't do his job and several people were shot and killed, the chief immediately spoke up and blamed conservatives! Same thing for the Norway mass killings. The first thing the media did was blame it on conservative Christians. They never miss a chance to lie and deceive, and unfortunately they're getting very good at it. We all have to stay on our toes and be diligent or the liars will win! When I decided to homeschool my "boy crazy" daughter to try to control her behavior, we had to go before a judge to 'prove' we were homeschooling. Their biggest problem with homeschooling? It reduced their federal funding! It didn't matter to them that their school couldn't even keep up with whether my daughter was in class or not! They just wanted the head-count for more money! Every time something like this happens, and I swear it happens in Florida once a month, the person in charge resigns. Does the person in charge really know what is going on? Do they really care? It's noted in the article that there were many warning signs and all were ignored. Making homeschooling parents undergo far more scrutiny than non-homeschooling parents is not going to stop the problem of child abuse and is ridiculous. Only if thorough investigations of verifiable abuse and steps taken to remedy the situation will the abuse stop. People need to be sure to report abuse, abuse based on fact or at least real concern, not vindictive reports. Too many signs reports are filed by disgruntled ex-spouses, ex-in laws, disgruntled neighbors. There are signs to look for and lists can be found on the internet, from church and school. I'm contacting local officials to try to get this ridiculous law changed. Hoping it will help. Remember, this is just a RECOMMENDATION by the grand jury. It's not a law (yet). Contacting your elected officials is a good idea, but be sure to read the linked article from HSLDA to get the scoop. Thanks for sending the update -- glad to know the regional director resigned! Anyway, the good thing is that the California homeschooling contingency, approximately 250,000 students strong, kicked backed really, really hard. California boasts of a very diverse homeschooling population...it is far from just us Christian, conservative Prairie-Muffin moms. Alternative education is very big here, on all ends of the political, religious, social, racial spectrum. Our schools are a mess, and they know it, and we have LOTS of families who are doing something different because they have to. The courts way backed off. They had mishandled the Ed Code on this one, and now we have case law on our side. I hope that families in Florida will do the same. This is a gross case of criminal child abuse...NOT a homeschooling issue. Every week of every year in every state in the country there are multiple stories made public about children in our government-run schools who are threatened, bullied, beat up, sexually assaulted or even murdered. The violence committed against these youngsters in our government-run schools is ALWAYS committed either by an adult employed by the government-run school or by other children who are supposedly under the supervision of adults employed by the government-run school. And yet, when an isolated case of assault is committed by an adult with a tenuous-at-best connection to homeschooling, the government's response is to attempt to force more families to send their children to government-run schools. This story is a classic illustration of a self evident truth. The government doesn't give two hoots about the welfare of our children--or anyone else for that matter. The government's ONLY concern is with amassing power and restricting individual liberty just as much as they can possibly get away with. The ONLY solution is for we the people to fight back through prayer and educated activism. All government infringements upon individual liberty must be fought all the time. We don't need to crack down on home schooling. We need to crack down on murder. If, upon conviction, this pair was promptly (i.e. before the sun set) lined up and shot ... others would think twice before doing likewise! Roughly 80 percent of abuse/neglect complaints are bogus? Really? When I handled them (incidental to other activities) it was more like 90 percent bogus. It has nothing to do with homeschooling. It has to do with who OWNS you. You are OWNED by the state and the state doesn't like you acting though you are free and sovereign beings, that you are not the slaves you really are and you are keeping them from indoctrinating "their" children. Who is going to turn you and your subversive ways into them if the children have not been taught by them what is subversive? If all homeschoolers in our state (FL) are suspect, then that's a whole lot of people. Tens of Tens of thousands are homeschooled in our state. If our state is that "dangerous" for kids, you better stay far away from us. Don't even take your kids to see Mickey. They might inadvertently come into contact with a dangerous homeschool parent. I'd even say its guaranteed. IT CAN ALSO GO THE OTHER WAY! It also happens that parents "homeschool" the kids in order to hide the signs of abuse. It also happens that some genuinely perceptive and correct friends, neighbours and grandparents are right in suspecting that homeschooling is a front for secrecy over the abuse. It also often happens that these whistleblowers become absolutely terrorized by these same "parents". So let us remember to be fair and honest here--for the sake of protecting the children!